Yikes! It's been a while. No excuses, I've just been really lazy. But anyway! With access to library books again I have found a new pattern that I've started. It's the Aran Bag by Debbie Bliss. I've knit the front panel so far and am casting on for the back panel. The yarn I'm using (this time around...I plan to make more than one!) 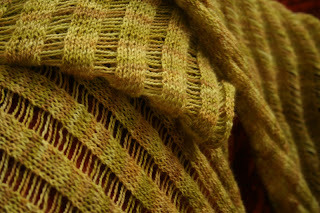 is Rowan Yorkshire Tweed Aran. I'm also scrounging around for fabric to use for the lining. This bag is going to be so pretty! It took me long enough but I've finally got the Clapotis bug. I've just finished this one and I am gearing up to make another one. 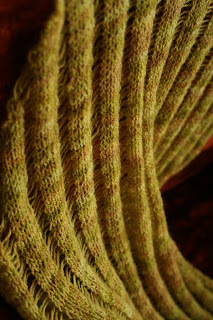 The yarn I've used here is Mama E's C*EYE*BER Fiber yarn from the Cake of the Month Club. The next one I make will have to be wider though. 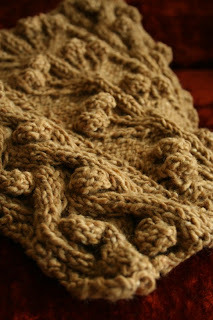 The width given in the pattern works better as a scarf for me and I'd like one that functions more as a wrap. No wonder everyone knits this. No wonder!